There are fewer murals in DC today. The old mural, now removed. 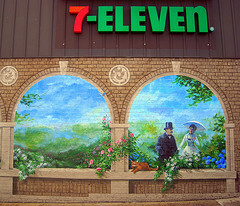 Just heard about this– the mural on the side of the erstwhile 7-11 on Connecticut Avenue in Cleveland Park has been removed, according to this tweet from Keith Ivey, which contains a link to a picture of the sad wall in its current state. …the mural on the outside had me wondering why the same guy was always waiting for the bus for the first month that I lived in the neighborhood. Mural looks like real people, don’t be freaked out. We’ll keep an eye on the space and let you know what shakes out.